Dissolved lead in your drinking water is a reality in Australia. 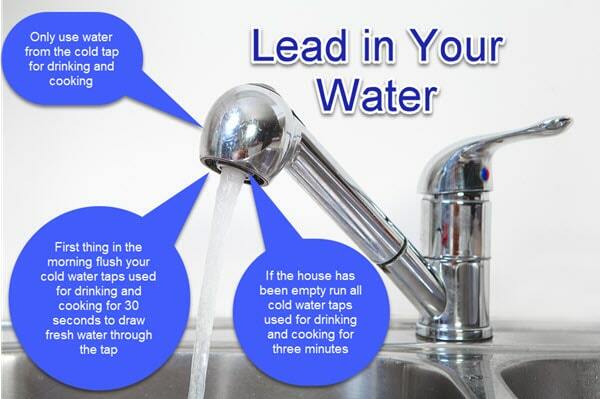 Lead is used across a wide range of plumbing products that are installed in homes and buildings. The most common products lead is used in is brass fittings and taps. Some brass plumbing fittings allow the lead to dissolve into the drinking water where the water has been unused for long periods. This process is more pronounced in your hot water system where the heating of the water to 70 degrees results in an increase in all dissolved metals in the water, particularly lead. This is why you should always use only cold water for drinking and cooking. If your water supply is sourced from a rainwater tank, you should also be aware that the increased acidity of rainwater may also increase the level of dissolved metals and lead from brass plumbing fittings. If a home or building has been unoccupied for a long period then it’s good practice to flush all cold water taps used for drinking and cooking for at least 3 minutes to flush out dissolved metals. If you are in public parks and use a water bubbler or tap it is good practice to flush the water for 30 seconds especially if it’s not heavily used. There is no need to have your water tested for lead. What we do recommend is that you follow the suggestions above to flush dissolved metals such as lead, copper and nickel from your drinking water.